In this article, I will compare Leica Trinovid 10×42 HD and Kahles Helia 10×42. Kahles company was the first to launch the production of riflescopes and was established in 1898. Their production of optical devices has increased and since 1900 they have begun to offer binoculars and telescopes too. The name “Helia” was primarily used for series of riflescopes in 1926, and then in 2016, the first series of binoculars with the same name was introduced. Leica began to make history in the production of binoculars in 1907. The first Trinovid series was introduced in 1957. Leica Trinovid became world famous in 1969 when NASA was successfully using it on the Apollo 11 mission. With the Trinovid HD series, the classic Trinovid binoculars were restored. In 2015, Leica introduced two new Trinovid HD models, 8×42 and 10×42. Both of these two binoculars are offering amazing optical performance, great ergonomics and are extremely beautifully designed. They are light-weight and compact, easy to use and practical enough to carry around. Leica somehow managed to store as much as possible in a small and solid casing of Trinovid. Helia is larger and heavier, but still very aesthetic, and its great advantage is the design with an open bridge. The open bridge is particularly desirable among hunters, as it enables better grip and focusing with one hand. Trinovid’s barrels are very short so the binoculars can be easily held in one hand too, also the index finger automatically falls on the focusing wheel. Trinovid HD is coated in black, matted and soft around the bridge rubber. The surface provides good grip, it almost feels a bit sticky so it prevents the binoculars from slipping out of hands. The surface quickly becomes greasy. Helia also has a unique design. Binoculars are coated in caramel-brown, natural looking rubber with various details for better grip on the surface. On the underside of the binoculars, there are oval-shaped thumb rests. The rubber is matted, so it is not slippery and performs well even in extreme weather conditions. 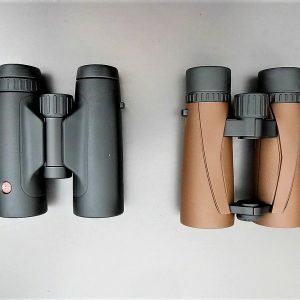 10×42 configuration, especially as far as these two binoculars are concerned, is recommended for stalking and hunting in the mountains. They are also suitable for the detailed nature observation, bird watching, traveling and safari expeditions. 42 mm lenses gather a large amount of light and 10x magnification is perfect for observing the details. These two binoculars are still small and light-weight enough for carrying around and for comfortable use. Both have a Roof – Schmidt/Pechan prism type. Leica Trinovid HD has its roof prisms coated with P40 (phase correction coating), and Leica’s HLS™ HighLux system that increases light transmission. The lenses are fully-multicoated, providing clear, sharp and bright images. Kahles offers very few information about Helia’s lenses; the binoculars also have roof prisms coated with phase correction coatings. A fully-multicoated system provides very sharp images without any inner reflections or distortions. The close focus distance is shorter on the Trinovid, which makes the binoculars more suitable for closer observations too, for example, butterflies and insects. The field of view is almost the same on both models. The focusing system on both models is central and both have a right eye diopter setting with a range of – 4.0 / + 4.0. Both binoculars have a very similar focusing knob, coated in black rubber with long bars on the surface. I have evaluated the grasp on both with a good 8/10. Helia may have just a slightly softer rubber, which is more pleasant to the touch. However, the rubber tends to get dirty fast. Central wheel rotation is just a little bit too fast and not too sturdy on Trinovid and it also produces sound, that is why I have evaluated it with a 7/10 and with a 9/10 on Kahles. Focusing on Khales is smooth and silent. The diopter setting ring is wider and thicker on the Trinovid and it has a red stripe imprinted for the orientation/proper diopter adjustment. Helia’s diopter ring is narrower and has a rectangular-shaped bump/button, that is kind of too big for precise adjustment. Both have several bars on the surface for better grip. I need to mention Helia’s open bridge body design again since it is such a great advantage. Both binoculars have multi-positioned eyecups with turn and slide mechanism and click-stops. Trinovid is offering 4 click-stops and Helia only 2. Helia’s eyecups are made of harder rubber that does not feel so comfortable when pressed to the face. They are also a bit too thick and hard to rotate. I had to use a lot of force to rotate them. Also, offering only two click-stops, sometimes makes it harder to find the proper eye relief. I absolutely love the eyepiece on the Trinovid HD! The rubber is soft, quality made and beautifully shaped. With 4 click-stops the eye relief is not hard to adjust and it certainly feels more stable and balanced. I have evaluated eyepiece’s firmness and quality on the Trinovid both with a good 9/10. I did not find the firmness and quality of the eyepiece that good on Helia, and that is why I have evaluated it only with a 7/10. The housing material on both is plastic and covered in high-quality rubber. The details are mostly plastic, except for the bridge that is made of metal. I love the Helia’s natural brown color but as far as the quality of armoring is concerned, my absolute favorite is Trinovid HD. The rubber looks really quality made, durable and resistant. Nevertheless, both binoculars are very well-built and aesthetic. I have evaluated the quality of armoring with a 9/10 on Trinovid and an 8/10 on Helia. Both are Nitrogen filled and O-ring sealed for water and fog resistance. Trinovid is also submersible to a depth of 5 meters and has a special coating on the lenses, called HDC (highly durable coating) that helps to prevent scratches. Helia’s external lenses are coated with oil repellent that helps with the latter and decreases the rate of abrasion. The binoculars are also very long-lasting with their robust design, but can only be submerged up to a depth of one meter. Trinovid HD is made in Portugal, and for Helia, we presume that it is made in Japan. As for the covers, they look like they were made by the same manufacturer- there is almost no difference between them. Both are included in the package and can be mounted on binoculars with rubber bands. Covers for the eyepiece are also almost the same. I have evaluated both with an 8/10 since they are very similar to each other- well made, but plain and with no logo imprinted on them. The warranty period for the Trinovid HD is 10 years and 11 years for the Kahles Helia. The price is approximately 150 EUR higher for Leica’s model. I have to say, the results did not surprise me; Trinovid HD’s optical performance is simply outstanding, comparing to Helia. It won in all the categories; it only lost a point for the Glare, but I think it would get this one too if we were testing the binoculars in better weather conditions ( on a sunny day). The overall impression was 6 out of 6 people would rather buy Leica Trinovid HD than the Kahles Helia. I preferred the Trinovid from the very beginning, in spite of being more expensive. I love the Helia’s design and the open bridge feature, which is truly a great bonus, but when it comes to the optical characteristics, Trinovid is an absolute winner. Kahles made a good pair of binoculars but unfortunately a bit too pricey considering how many better and cheaper models the market has to offer. Kahles Helia comes with innovative accessories, that are handmade of high-quality natural materials by Waldkauz®. The sling is made of leather and wool felt. The whole set is of a very high standard and beautiful. Leica Trinovid HD binoculars already come inserted into a harness strap made out of neoprene. Its use is supposed to be very practical, however, none of us was overly enthusiastic about it. The binoculars are difficult to pull out, and the whole design does not look too appealing and practical. Hi, Thank you for very clear comparison. I am wonder if you can compare Leica Trinovid 10×42 HD with Tract Toric 10×42, Since the latter got so much interest in community due to its price. Such comparison would be very interesting for bird watchers as well in 8×42.